Australia is known for its fantastic climate, picturesque beaches and friendly people. This attracts people from all over the world to migrate to Australia and become its permanent residents. To encourage immigration, the country offers various types of visas like student visa, work visa, business visa etc. which lets the people migrate on a visa as per their own specifications. Some visas also provide an opportunity to migrants to gain Australian citizenship and become permanent residents of the country. But immigration to Australia includes going through a whole process of documentation and formalities. This process is so lengthy and tiring that many immigrants find it very difficult to complete the whole process on their own. So if you are planning to relocate to Australia it is recommended to take services of a registered Australian Immigration consultant. 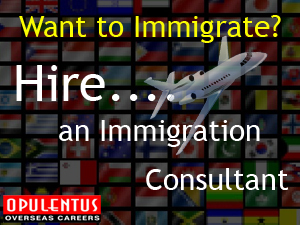 Hiring an immigration consultant will make the whole visa application process easy and hassle free. The consultant hired will help you understand the various types of Australian visa, immigration points required for each, the visa process and how to get Australian Permanent Residency. He will also suggest best visa suited for you depending upon your immigration points. In addition, he will handle the whole visa process, from filling out the application form to getting in touch with the Australian Department of Immigration and Citizenship (DIAC). Relocating to a new country will also mean getting a job to stay for long. The consultant will help you get a job in Australia under the skilled migration program. Applying job application through the immigration consultant will make you eligible for a special Employer Sponsored Visa or the Employer Nominated Scheme. Both visas allow you to migrate to Australia funded by your new employer. So hiring an Australian Immigration Consultant will not only save you from the pains of facing the entire immigration and application process alone, but will also help you get a job and inform you about other crucial information at a reasonable price.